To make choux pastry: Preheat the oven to 400 degrees F. Line 2 baking sheets with parchment paper. In a saucepan over medium heat, bring milk, butter and salt to a boil. Add flour and keep stirring until the dough dries up and pulls away from the side of the saucepan. Immediately transfer the dough to the mixing bowl. Mix with the electric mixer, adding one egg at the time, until well incorporated. Pour the dough into the piping bag with half-inch tip and pipe the dough onto the prepared baking sheets (about 1 to 1 1/2-inch in diameter), an inch apart between them. Bake in the oven until golden brown, about 20 minutes. Remove form the baking sheet and cool down completely. To make Irish cream filling: In a large mixing bowl, beat the cream, sugar and Irish cream liquor until the cream becomes stiff and hold its form. Transfer cream into a piping bag with 1/4-inch tip (or cut the tip of the bag with scissors). Insert the tip of the piping bag into the side of each choux pastry, squeeze the bag and fill each pastry with the cream filling. To make white chocolate ganache: Combine butter, white chocolate and whipping cream in a microwave safe bowl. Microwave for 30 seconds, mix, and continue until the mixture is smooth. Dip the top of each pastry puff into the chocolate mixture. Arrange the puff pastry on the baking sheet or a tray. Sprinkle the tops with some dried lavender buds. Store in refrigerator until the chocolate set. Serve. These sound heavenly! They are beautiful too! These look beautiful and I love the white chocolate. 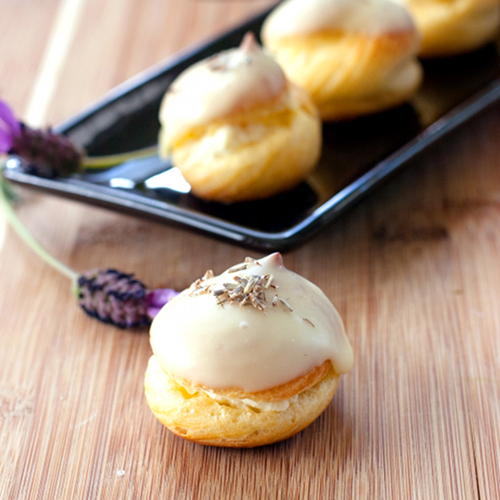 Ohh i've never had white chocolate in my cream puffs, and lavender is a fantastic, subtle addition. how pretty! I love cooking with flowers. They are so pretty and provide such a great, complex flavor. This would be perfect for a Mother's Day brunch! 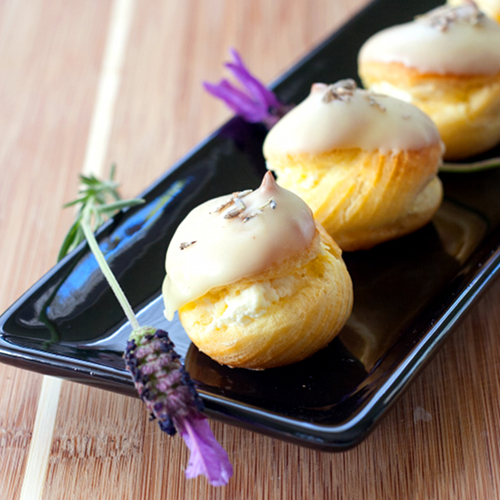 Love lavender...this puffs look and sound delicious!!! Great idea! Hi There, Congratulations for being on top 9 !!!!!! This is looking so delightful and appetizing. A very well made post with beautiful pictures. Loved the presentation. I've bookmarked this special recipe of urs and wud love to give it a shot. Have a wonderful week ahead. Thanks & Regards, Sonia !!! Congrats on Top 9! I love making cream puffs but haven't thought to add irish cream! Oh such beautiful recipes! Lovely idea to use lavender too! I've got a Cocktail Contest going on right now--Come over and link up your favorite beverages!! What a beautiful photo! What a beautiful morsel! Love these little darlin's, a perfect sweet nosh if you can have only one! it is spring and lavender is just so perfect an addition to dessert. I love the elegant presentation...Lavender is royalty! This looks so wonderful! I love seeing how creative others are with lavender! I really want to try this recipe!